Blame generation now, blame generation online media. Here's proof that when it comes to fashion events, people are most likely going to watch, stare, gossip, eavesdrop, photograph AND twitpic whatever move you make. 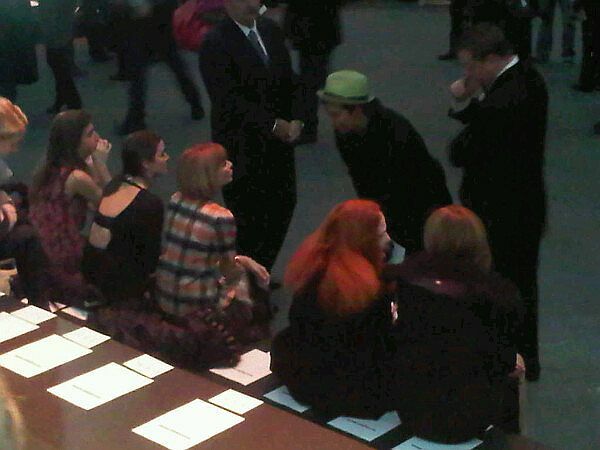 One of my twitter followers cheekily took a paparazzi-style photo of me chatting to Anna Wintour using his phone, at the Alexander Wang show in New York last month. Let me share to you what I went through when that photo was taken. Earlier that day, Anna commended me for my use of these neon green hair scrunchies I got from Brazil as ankle bracelets to my Lanvin sneakers. I thought I'd ask her a question I've always wanted to ask. Me: "Hi Anna! Out of curiosity, and Lady Gaga cover aside, when was the last time you did something for the first time?" AW: *chortle* "Couldn't you have asked a simpler question?" Me: May I take your photo instead? After getting my shot, I slowly walked away to preserve whatever dignity (what dignity?) I have left. What else is there to do? Hang around for idle chatter and banter? I came to her to ask that one question, she answered, that was that. NEXT! Gotta move on, move forward and try to find another familiar face to talk to. Besides, I could feel and see from the corner of my eyes that they are talking about my question. It's that blogger! Oh no Bryan didn't! Burn! Send him to outer space! I thought, oh geez, I blew it up big time! Not more than ten feet and a few seconds later, one of the bodyguards called me (SIR! EXCUSE ME, SIR!) and I saw Anna stretch one arm and motioned me to come back to her. She smiled and said, "I went to China." Me: "Thank you. I saw those photos online a few months back." Instead of feeling defeated, I walked away with my chest out, beaming with joy and confidence this time around. 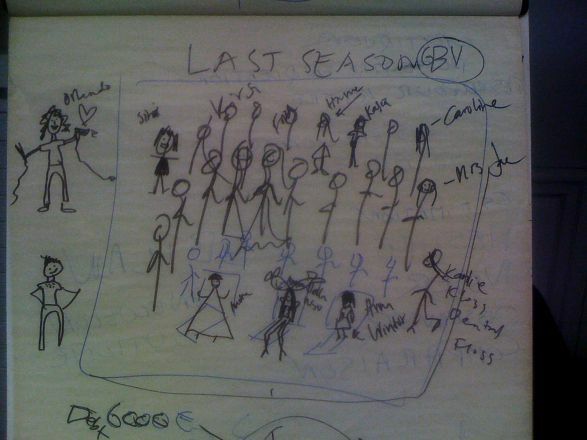 By the time Paris came I'm all 'oh hay mamacita mother hen, how are you?' on her. What a pleasant surprise! 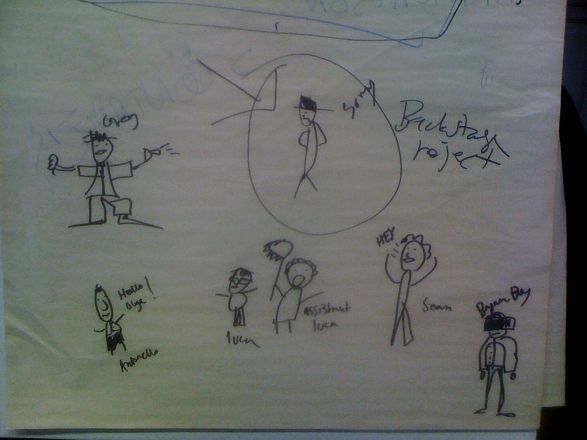 Swedish sensation Frida Gustavsson sketched what it’s like backstage at a show and my favourite snapper Sonny Vandevelde took these photos using his phone cam. 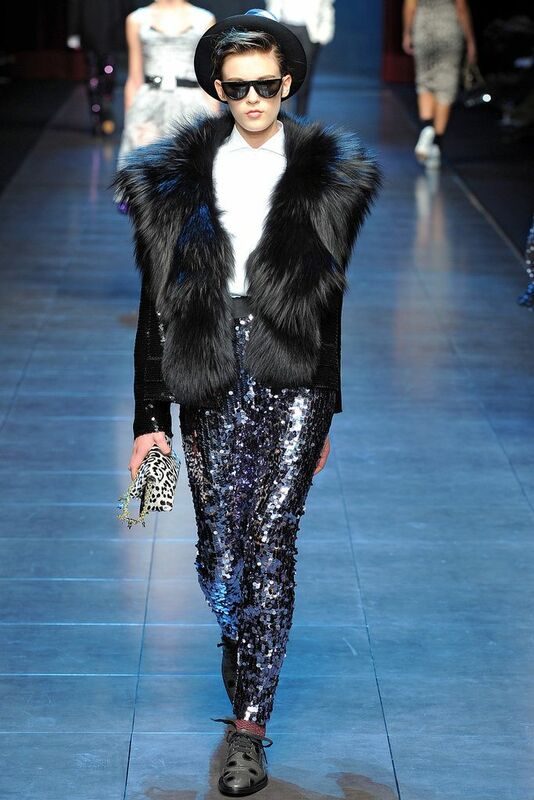 Dolce & Gabbana's fall/winter 2011 collection is definitely one of my favourites from Milan last month. It's refreshing the power duo departed from their usual fare of delectable lace dresses and offered a new dressing proposition for fall: androgynous, gender-bending looks but still with the trademark Dolce & Gabbana tailoring, glitz and dazzle. I salivated over the front row because there were so many desirable pieces from the collection. The first thing I saw when I went backstage before the show was the pair of purple sequined trousers. Stefano Gabbana immediately pointed out they made it in three colors... and when I saw them on the runway during the show, BOOM!, it was a ME ME ME ME ME moment. Click click click for more photos. 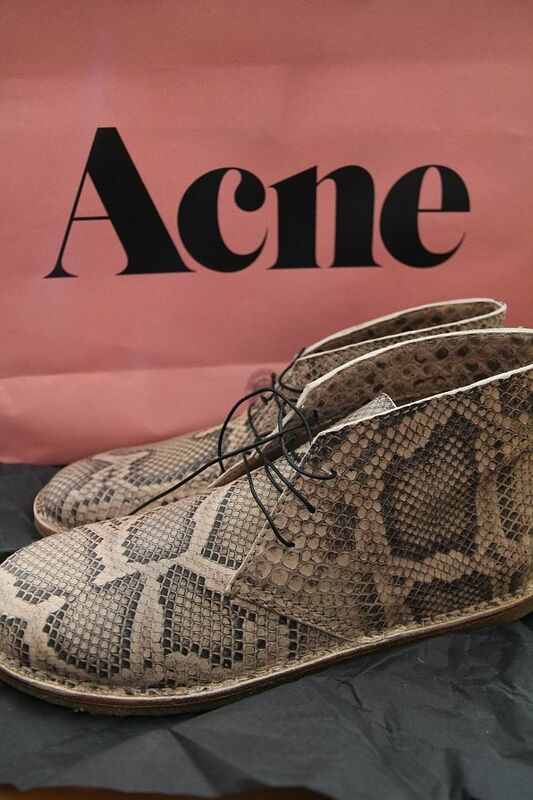 It was love at first sight when I saw these snakeskin desert boots at the Acne store in Stockholm. I was planning to buy them before I leave because my good ol' boyfriend's shoebox of an apartment is already cluttered with my stuff. Lo and behold last night, my friend Elin gifted me with these boots. Imagine the delight and surprise! What would you buy with $10,000? Canadian super retailer SSENSE is giving away a $10,000 shopping spree. I'm impressed with their selection of brands: Maison Martin Margiela, Lanvin, Givenchy, Rag & Bone, Alexander Wang, Thakoon, Comme des Garcons and more. Contest ends on March 24. Click HERE to join. If you live in Scandinavia, have you picked up the maiden issue of the new Styleby magazine? I have. Sweden's most prolific blogger (and multi-media personality), Elin Kling, is on the cover. Congratulations on the new magazine! It's my birthday tomorrow and I thought I'd take up something new. 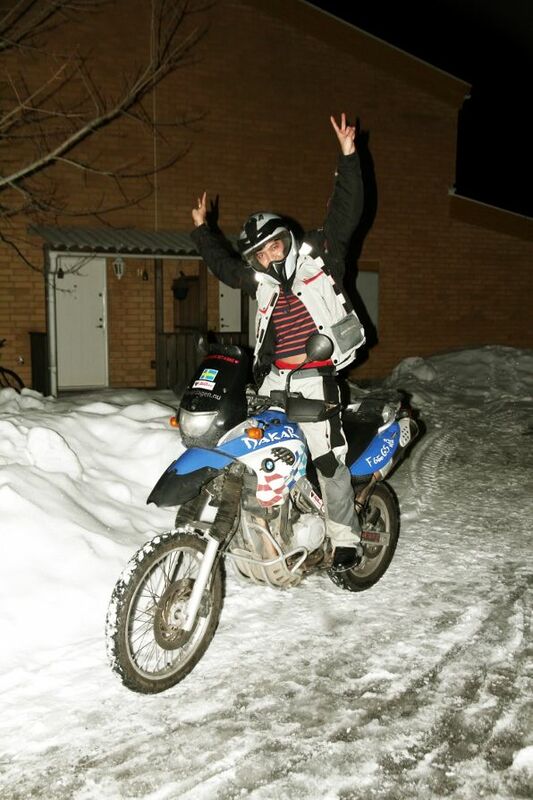 After a month of fashion high, I have a new obsession: motorbikes! J'adore the colour orange. J'ADR Anna dello Russo! On me: Karen Walker sunglasses, vintage bowtie, Filippa K jacket, Uniqlo shirt, H&M trousers, Jil Sander shoes, Prada stole. On Anna dello Russo: sweater, dress, sunglasses, bag, shoes all from Prada. Fashion month may be well over but honey, it ain’t spring yet! We had a blanket of snow yesterday afternoon here in Stockholm. Hat by State & Lake, sunglasses from Karen Walker, shirt and cardigan from Uniqlo, top from Prada, belt from Hermes, jeans from Diesel, bracelet from Accessory Lab. Going through the endless photos I took in New York, Milan and Paris, I found it very amusing how fashion people wear spring clothes during winter to watch the autumn shows/clothes that are going to be sold during summer time. Some of the key pieces and accessories have already been worn to death by numerous editors left, right and center. My friends over at Boston's iconic Louis store are inviting bloggers for an event next week If you happen to be in (or visiting) the area next week, be sure to pop by Louis on March 24 from 5 to 7PM. Don't forget to RSVP by emailing jhumphrey@kortenhaus.com. My very weak bladder was about to burst during a long commute outside the center of Stockholm a few nights ago. The BF thought it was best to get out of the subway and try to find a place where I can drain my pipe so to speak. We ended up at this dive bar and my man, being a real man, simply could not resist the appeal of five dollar beers. He had one, I had one and then there's the flip cam. 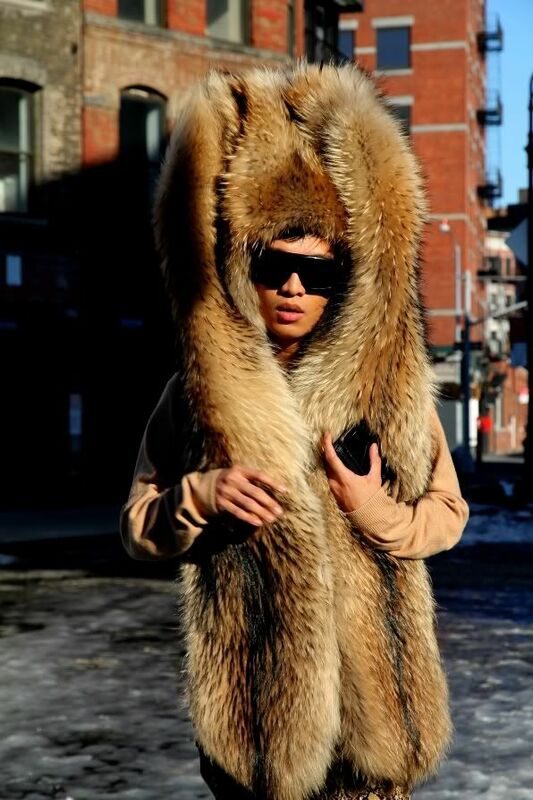 During the fall/winter 2011 collections in New York last month, the team at Kanon Vodka livestreamed my adventures for an entire day, online. Click HERE to watch highlights from the livestream. Have you seen the latest issue of American Vogue? Rihanna, in Chanel, looks ravishing on this (long-overdue if I may add) cover. I'm still recovering from Lady Gaga's marvelous March issue (one of my faves from Vogue as of late). Whoever spiked the watercooler on the 12th floor deserves a gold medal. One smashing issue after another, it's obvious that they've been drinking some major Kool-Aid. Can't wait to get my hands on this one. Big kudos to Anna and her team. High-fives all around! Here's the view from my seat at the fall/winter 2011 Miu Miu fashion show in Paris. Don't try this at home. It takes a very special kind of girl to effortlessly stride on top of a street vent in a pair of high heels. I took these shots of Stephanie LaCava's Nicholas Kirkwood shoes as we rushed from Hotel de Crillon to the Grand Palais for Chanel's fall/winter 2011 fashion show. Depending on my availability, click the button below to speak to me on the phone for free! USA callers only please. Shower me with attention and inflate my ego. Email photos of your love and I'll add you to my ever-growing collection. Be creative! Be spontaneous! 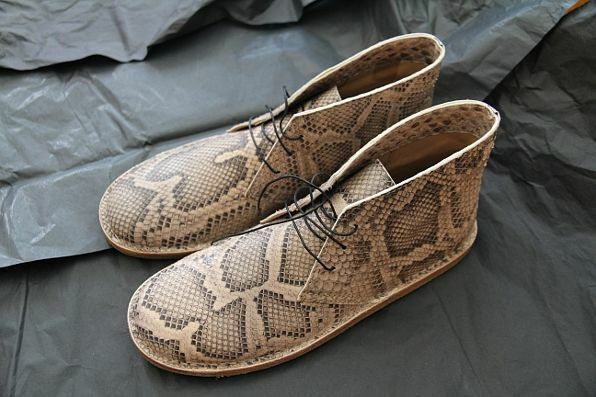 Send them to bryan@bryanboy.com today! Click HERE to watch behind-the-scenes footage of the shoot.